Get a free evaluation to get the help you need! Insurance companies often deny valid claims! Get your case handled quickly and professionally! Take action now with a free evaluation! Injured on the job? 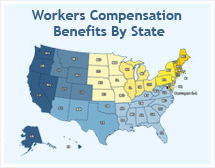 Get a free Workers’ Compensation claim evaluation now. It's FAST and FREE! Statistics show that the majority of Workers’ Compensation denials are applications filed without the help of a qualified attorney. The legal assistance of a professional attorney can substantially improve your chances of being awarded Workers’ Compensation benefits. Furthermore, a professional attorney will maximize the amount of benefits awarded to you and get you your benefits quickly - WHEN YOU NEED THEM! For an immediate FREE online evaluation, just answer the questions below and a qualified Workers’ Compensation attorney will provide you with a no-cost, no-obligation evaluation of your claim. Your request is confidential and your information will never be shared with your employer.